This is the third time in three years we’ve hired a car to take our weekend excursions beyond the bridges. That’s a pretty poor record and one we only think of remedying in spring and autumn – those very short windows between long, extreme seasons. Before you know it, it’s too hot to bother or too cold to contemplate. 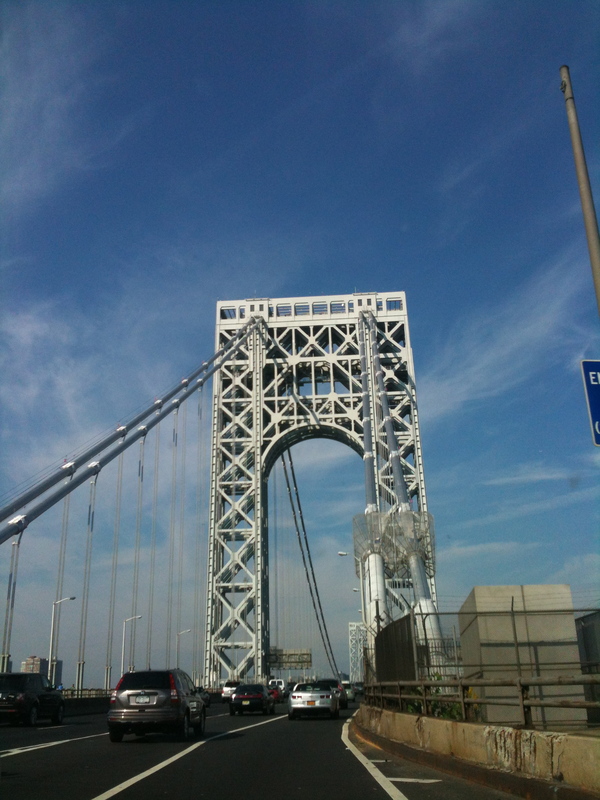 So, in 10am Saturday-of-a-long-weekend traffic, our rental car crawled up the Henry Hudson Parkway before crossing the George Washington Bridge to New Jersey and the other, non-Manhattan New York. We were headed upstate to New Paltz, a quaint town at the foot of the Catskills, full of olde worlde charm but kept vibrant by the State University of NY campus. 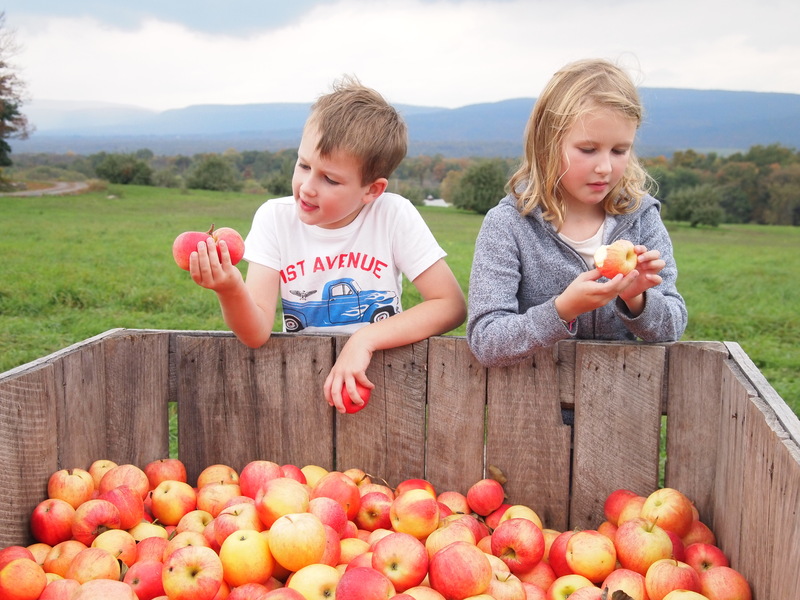 In October it’s full of students and day-trippers, up for all the pick-your-own orchards. We were pulled up across from a Shop-Rite, with McDonald’s just up ahead on our right. In a completely different town (Newburgh). What are the odds? It took another 40 minutes or so of back-tracking up and down Route 32, with a few accusations of “bad googling” from the driver to the navigator and lunch time came and went. But leftover birthday cake made a good enough lunch and when we finally found the farm, the rest of it grew on trees. Apple Hill is a no-frills operation on the side of the road. Just turn up and pay $10 for a peck, $20 for a bushel and fill them up. 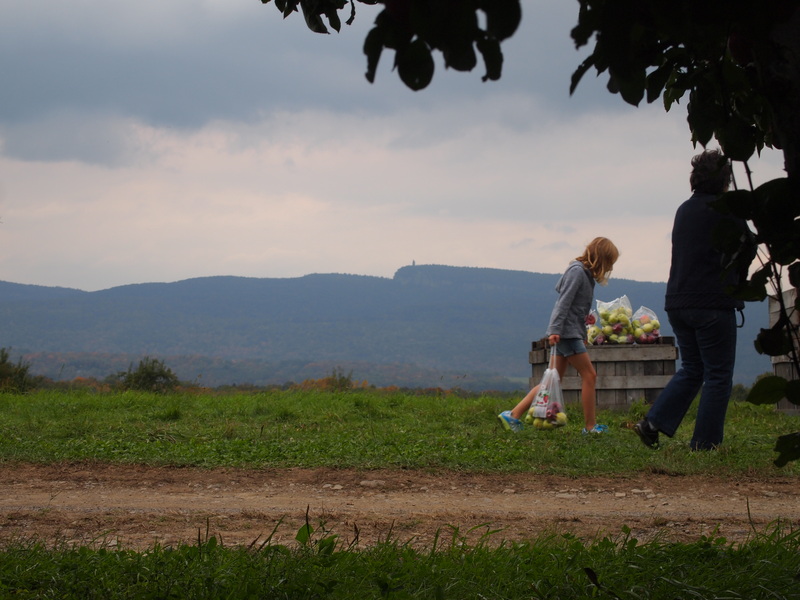 Its concession to city-tourists is the hay-rides between the roadside and the orchard at the top of the hill. As far as the kids were concerned, a peck-bag each and a hay-ride was all you need for an “awesome” day out. 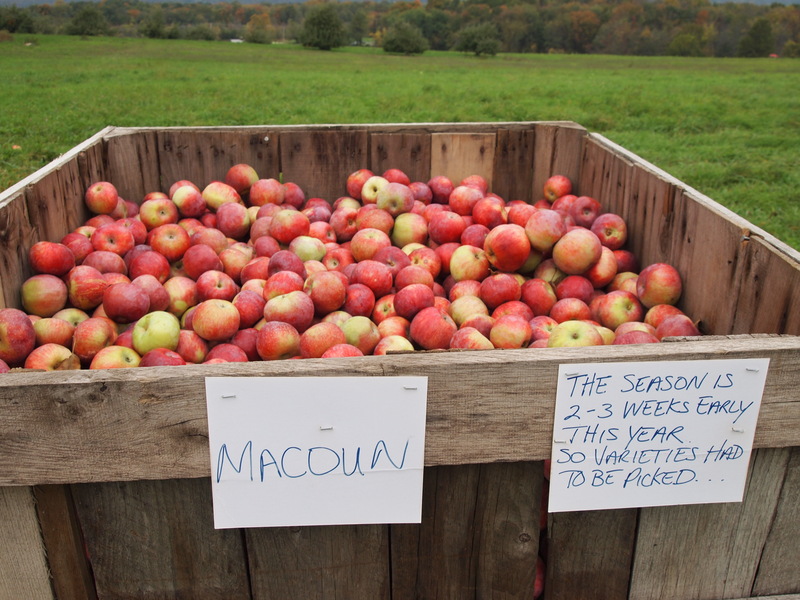 A race up the hill, past the Macoun, Jonagold and Crispin, which had all been picked early due to the unseasonably slow onset of a cold snap, and everyone disappeared into the trees to find the perfect apple. The early apples go into big crates, lined up along the crest of the hill. It can make picking feel a bit like shopping, except that everyone’s so helpful. And so diligent with quality control! We finished just as the weather turned, and autumn officially set in for the year. Then drove the ridiculously short and simple four minutes into New Paltz and sat, somewhat stubbornly given the brisk change, outside at the Harvest Cafe. There we had the best burger this side of the Minetta Tavern. Lunch at 4:30pm after running around an orchard all afternoon is bound to be good. Eating apples straight from trees was good. Just getting out of town was good and our timing was perfect. With Halloween looming, the apples will be gone when the leaves peak in a couple of weeks. Even getting lost on the way there wasn’t so bad – it meant we were outside during the hour in which the season, quite literally, snapped after that final little warm spell flickered out on Friday. The sky darkened and the wind whipped up as our beautiful apples bounced around the boot on the way back through the Hudson Valley. Ruby dragging her half-peck of perfect apples.